This has been a rough week of workouts. I haven't managed to get up at 5AM to go to the gym most days to get in my cardio. I'm bumped up to 60 minutes daily and she wants me to split that morning and evening, which we thought would be perfect. I could do 1/2 hour on the elliptical in the gym in the morning, then we could do a long bike ride in the evenings. Well, we've managed to do 60 minute bike rides this week anyway. For Christopher's speech therapy appointment on Tuesday the Speech Therapist was here to kind of check in. His normal appointments are with a developmental aide (I think that's what her title is) and then the SLP would come ever 6 visits or something. So, this week she came, and he really seemed to open up. We got several new sounds and he played with her. Today we had our normal appointment but it was early and we hadn't had breakfast yet, so needless to say, he didn't participate that well with her today. I'm hopeful though because it does seem like he is starting to respond and trying to make new sounds more frequently. I know so many people who are pregnant or just had babies. I love it because I love babies, but I'm noticing a little catch, a little bit of pain with every announcement and that is fairly new for me. It's weird, it doesn't diminish my happiness for the couple, or happiness to see that new life...it's almost like a longing. I'm still trying to think less about GETTING pregnant this month so that it is not in my head every day, but it's hard when you want something so bad to not think about it. Jason and I played Cribbage last night and I missed skunking him by like 6 points. It was simultaneously the best hands I've ever had in Cribbage while he had the worst he's ever had. It was a great night! ;-) We used to play a card game almost every night but we've gotten out of the habit, and it's been fun. Our town has 2 parks locally and one of them is really nice, but the other has seen better days. 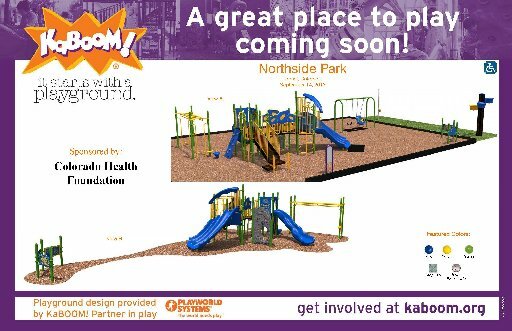 Well, our town got a grant to get some new, better playground equipment and we are so excited! They will have volunteers putting it together, which kind of makes it more exciting and more "ours". This is the equipment that was chosen. I'm in a food slump. Since my diet is so strict, I'm struggling to find things that I can eat that I want to eat. Mostly I'm eating veggies and meat. The real problem is that I'm not a big veggie fan. Suggestions are welcome! Since we signed up with the state and the city and are now an official business, we needed to organize things a bit better. So we set up a scheduling calendar using Google Apps, and let's just say, it was insane to get it so that I could set up the appointments from my phone and Jason would get a notification on his phone. We got it...but it was not easy!